Every day we're bombarded with underwater photos and videos, but it takes something a little different, something a little special, to really stand out from the crowd. Ocean Shutter's recent film, Darwin's Dream, really stood out to us. Yes, it is a fantastic film and it has won some prestigious awards and selections, but it also contains a very strong marine conservation message. We decided to reach out to creator Dustin Adamson for more insight into this message, which we share below. Enjoy the film, and always be thinking about ways to protect our oceans and the marine life that lives there. Charles Darwin, a renowned scientist was fascinated by the life and animals in the Galapagos islands. It helped him form his theory of evolution. The idea of "What if" Charles Darwin could have seen what was below the surface of the sea was my inspiration behind my short film Darwins Dream. It is truly an amazing experience. For any diver, the Galapagos Islands has to be on your bucket list. If its not, what are waiting for? With creatures like hammerheads, penguins, mola mola, whale sharks, mantas, and even marine iguanas it is sure to satisfy any divers appetite for great diving. 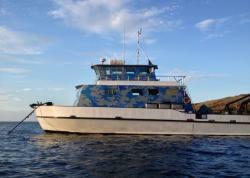 The best way to dive the Galapagos is by Liveaboard. This is the only way to dive the famed Wolf and Darwin islands. And they sure didn't disappoint. The Galapagos Islands are known for big animal sightings, and also for challenging dive conditions. Our trip was no different. As a filmaker, I want up close shots and smooth footage. The surge combined with current made shots at Wolf and Darwin very difficult. The lack of light was also an issue. In August, it is known to be cloudy. But that is also the prime season for Whale Sharks. At the end of our first day at Wolf, we had an unusual Whale Shark sighting. Not thinking anything of it other than excitment, we were even more excited for the next day at Darwin where there were expected to be many more Whale Shark sightings. Only to be disappointed the next day with no Whale Sharks. What was going on? The next day we found out why. To our surprise there was a family of 5 Orcas in town. The guides said that they come around every 5 weeks to prey on the whale sharks and other animals. We were the lucky group that got to witness these beautiful creatures in their natural habitat and not a tank. 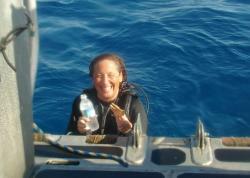 One of the highlights of my diving career. While it was dissapointing to only see 1 whale shark, we did still get to see the other stars of the islands such as schools hammerheads, eagle rays, turtles, schooling jacks, silky and galapagos sharks, and even some dolphins. Not bad at all! The next day diving on the west side of ferdinadina island, I had some of the most unique dives I have ever had. I also got some great shots. One one dive we had Molas that swam a foot from my dome port, sea lions, red lipped batfish, nudibranch, turtles and to top it off a Manta flyby. We were also treated to a dive just to see the marine iguanas. Such a unique dive and one I will never forget. We apparently had an unorecendented day of good vizability. It normally isnt that clear. When you go to the Galapagos, remember it is on your bucket list, make sure to spend at least a few days for some land touring. The topside animal sightings are the most unique of anywhere else in the world. Charles Darwin certainly was fascinated by the land animals. He would most certainly have been mesmerized by the underwater creatures. 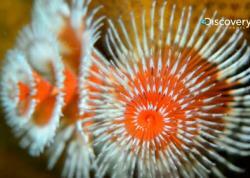 Visit the Ocean Shutter website.